The lady standing behind the table of sandwiches pointed the scissors at me. I had travelled a round trip of 560km (400km by car and 160km by bicycle) to collect my ‘Tour of Sligo’ bracelet and complete the set (An Post: Tour of Waterford, Tour of the Burren, Rebel Tour and Tour of Meath). 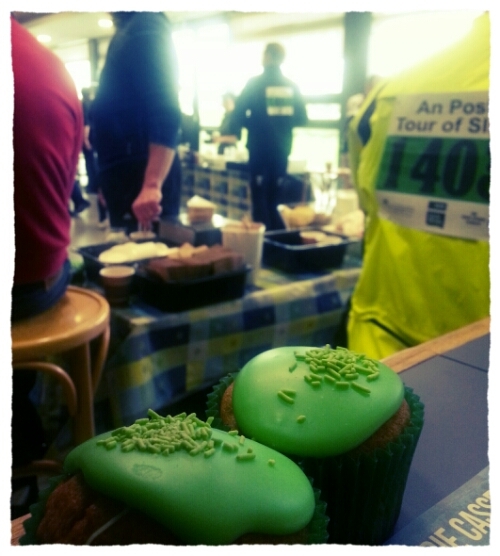 I had survived the 160km route only to be denied by the mean lady in charge of the Sligo IT caterers. She shrugged as the scissors cut the bracelet from his wrist. She handed him the bracelet so that he could hand it back to her as he should have done when she first asked. He looked sheepishly at the slice of Ham between two slices of white pan. The theme music from Platoon played on the tan-oi as he turned away. ‘I need it to get my collection’ I also pleaded. ‘I need it to get paid’, she replied curtly. A obvious solution was to keep the bracelet and thank her for her help but I decided not to upset the ‘sandwich cart’. Its not like me. I usually like to start hassle and spread disharmony wherever I go but I was tired and I let it go. When I look back now I realize it was only a paper bracelet and a lousy sandwich. I regret it all. I should have gone for it and said something that caused a fuss. and made Mean Bun lady cross. Ah well- I got the final laugh on her- I took a second cup of coffee and took two of the Green Tea cakes even though there was a clear one sandwich, one coffee and one bun policy in place. The An Post Tour of Sligo was fantastic and I am glad I left without my Bracelet as I will be going back again next year to get it. This entry was tagged An Post, Cycle, cycling cork rebel tour rain, etape, Mean lady, revenge, sandwich, Sean kelly, Sligo Tour, Sportive, supportive, tea cakes. Bookmark the permalink.